The compact, white frame building is cocooned snugly between two other houses. In the back stands, a large tent-like screen structure. Out front, a ramp of concrete faced with blocks of limestone beckons me out of the rain. This is my second visit in two years. This time Doug has invited me to write about his dream. Doug Beardsley, a grown-up child of the sixties, welcomes me from behind the cluttered counter of his converted greenhouse. Wearing blue jeans and a t-shirt, he smiles and invites me in. His black hair is slightly balding on top and long in the back. A full beard and mustache mark his rugged spirit. He radiates a childlike excitement as he prepares to show me his new developments. 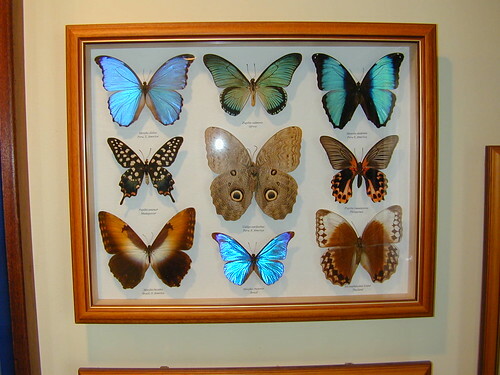 Doug’s partner Bill Hill is adjusting a display of mounted butterflies in a glass-covered case. He is also a middle-aged man. His sun-highlighted hair stands in contrast to his Florida tan. He owns “Butterflies in Flight,” a portable butterfly display, and works out of Naples, Florida. In 1988 Doug heard of Bill’s business from a friend and visited him in Florida. 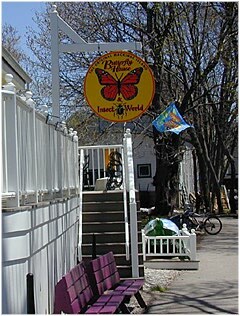 They entered joint ownership and opened the Butterfly House on Mackinac Island during the summer of 1989. Bill laughs as he tells me, “Yeah, here we are, a couple of guys in their forties, still playing with butterflies.” Play is part of the dream. But for Doug, developing this place is also a matter of survival. Doug loves this island and has not only survived its tough winter climate, but has learned to live in harmony with the rugged spirit of Mackinaw. The early Indian inhabitants believed it was the place of the great dancing spirits. It has survived skirmishes between Indians and settlers and major battles between the French and English soldiers. Despite the desolate winters, in the summer it is a place of serenity and beauty. Doug has loved this place since his growing up days in Lansing, Michigan. In the early seventies he attended Michigan State University, studying crop, turf, and soil sciences. Like many others of his era he attended to his studies, for seven years, and never earned a degree. But he did learn enough to begin building his dream. During his college years he developed his own yard care business. In 1977 he moved to the Island. For eleven years he worked for Sawyer’s Green House, an island fixture since 1905. He also began his own yard care business on the Island, with fourteen employees looking after seventy-five lawns. Since beginning his Butterfly House he has trimmed that business down to four employees. In 1988 when he purchased the business, the beginnings of his dream began unfolding, as he transformed his greenhouse into a sanctuary for butterflies. Here he nurtures various species in a controlled habitat and opens it up for visitors like me. He charges three-dollars for adults and two dollars for children, but always hopes for more generous gifts from kindred-spirited tourists. He spends most of his days breeding butterflies, re-modeling the buildings, and offering tours. Doug has plans for converting a cluttered storeroom into a new entryway. He also plans to build a new ramp up to the building, and has a dozen other projects for down the line. One project will be a display case in the entry area for viewing live butterflies close-up. The present one is a simple frame with a glass front and back. Bill takes the 2’x18″ glass off the back so I can get a close-up camera shot without the glare. Inside are various pupa, chrysalises, and emerging butterflies. A stray black-and-white striped butterfly crawls onto the counter as I talk with Bill. Showing no surprise, he gently guides the delicate creature onto his finger where it sits for a while, fanning its wings. Eventually he prods it gently with his finger, guiding it back into the display case. Doug is scurrying around the office, a small cluttered room with large windows separating it from the main entry area. He is searching for something, trying hard to sort through the tangle of books and paperwork. Paperwork is a constant struggle for Doug. Surviving the financial dilemma of beginning a business has been hard, as expenses pile up and the costs of equipment escalate. Survival is not easy. Financing this enterprise is a challenge. The continual need to seek backers is discouraging, but not enough as to make him quit. Last year when my wife and I visited, Doug smiled and asked me if I was interested in investing in his dream. Shirley and I had saved our quarters for a year just to spend our annual two nights on the Island. We obviously were not financier material. Even with only a handful of butterfly houses in the United States, any financial backers are a little wary of Doug’s venture. He finally decided if he were ever going to build a permanent structure, he would have to step out on his own and seek bank financing, which he eventually did. 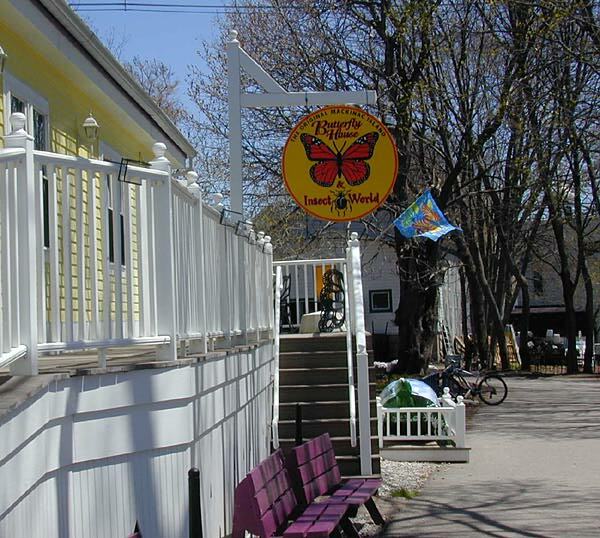 So far he has survived the hurdles of hard times and succeeded in establishing his business on this island where visitors from across the country stop in to share Doug’s dream of the Butterfly House. 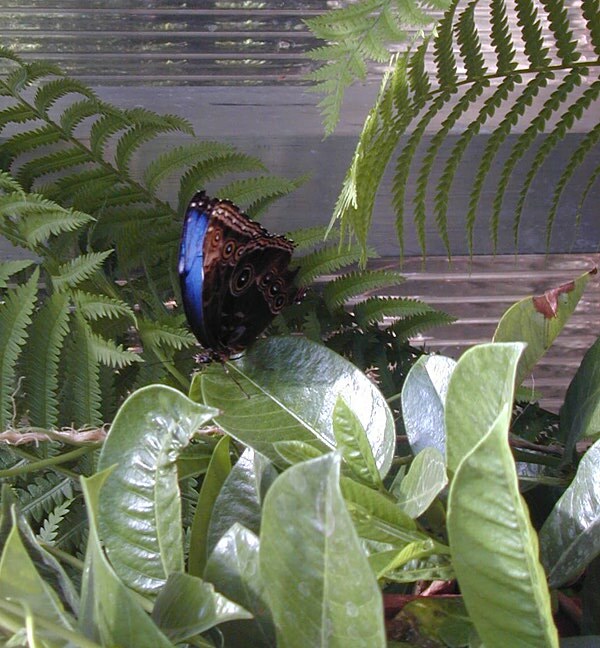 Original Butterfly House – Click on photos to enlarge. I walk outside with Doug to where the greenhouse once stood. The old Sawyer Greenhouse has been torn down to make room for the new structure. 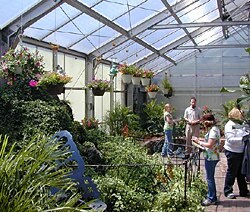 Positioned in the middle of the large courtyard is the Butterfly House. It is a 30’x 40′ black-mesh tent supported by 2″ diameter tubing. The screening is a fine veil, which slightly darkens the view into the tent. Work is already beginning, to replace the tent with a permanent structure…one that can be used all year round,” Doug says. In 1993 work began on the new structure to replace the tent. It will contain a controlled temperature environment allowing these keepers of the stock to nurture new life throughout the cold, harsh Mackinac winters. The tourists, who visit the Island and many of the local residents, usually leave the beauty of Mackinac behind as fall warns of winter’s storms. In the fall the butterfly’s breed and lay a new batch of eggs, which does Bill transfer to the warmer climate of Naples, Florida. Nearly 500 plants and the tent are transported by horse-drawn wagon to the Island’s loading docks. The load is transported by a ferry to a waiting U-haul truck and then loaded onto a plane headed for Florida. Although the stock is now shipped off the island, when the permanent structure is finished Doug will keep the butterfly house open throughout the winter. Most visitors and many island residents choose to winter elsewhere. Last year he traveled to Florida to check out other businesses dealing with Butterflies. Next winter he plans to take a trip to Costa Rica and check out breeding farms in the rainforests. But most winters Doug chooses to stay put with his family and enjoy the serenity of the silent winter’s nights. Six years ago Doug met his wife Theresa, when she came to visit the island as a tourist. Together with their two children, they spend the long Upper Peninsula winters reading or cross-country skiing. Doug works on plans for his business and Theresa works to keep up their home. Separated from the mainland by a thick layer of ice, Doug has ample time for remodeling, repairs, and reworking his dream for the spring opening. When the waters of Lake Huron thaw and the first ferries transport Island visitors to his doorstep, Doug is ready to share his new developments. Doug shows me quickly around and then lets me just wander and enjoy. Twenty benches serving as plant stands, manufactured from treated two-by-fours, line the perimeter of the walls. Several of the benches jut out into the main area. Each one is built like a set of steps with three levels. Black plastic pots, interspersed with some clay ones, filled with a plethora of plants, huddle together on the benches. At first my eyes notice only alisiam, marigolds, and snap dragons. But as we stroll on the chipped-bark-covered ground, my eyes are drawn to corepsis plants, ferns, and passion vines. I pull out my camera and begin to search for a butterfly. Doug smiles and tells me, “You have to develop butterfly eyes.” He points to a plant near us. Slowly I see more than fennel. I perceive an eastern black swallowtail and then another, and another. Soon, everywhere I look there are butterflies, and butterfly eggs. There are no predators here in the Butterfly House. Birds might be flying wistfully over the top. Wasps might be darting searchingly around the courtyard, and frogs may be squatting to watch from the outside. The most threatening enemy, man’s uncomprhending destruction of the butterfly’s habitat, is being held at bay by the proprietors of this place. 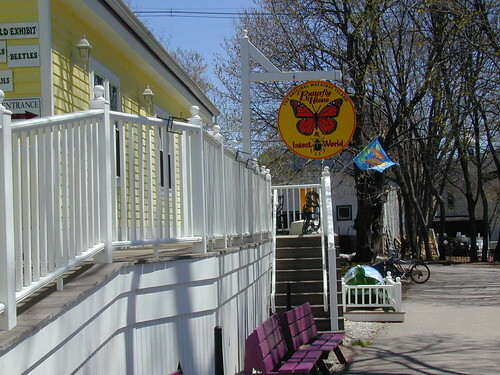 The Butterfly House is a refuge, a place of protection for the butterflies. My attention is drawn upward by a slight flutter of movement. Silhouetted against the blue sky are butterflies lightly clinging to the inside of the screen roof, and on the taller plants. 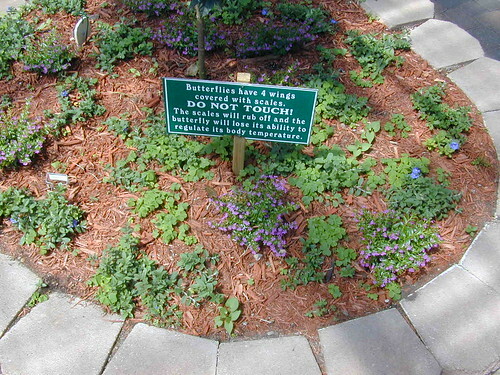 They are motionless except for an occasional flitting from plant to plant. The air feels cool. Doug says butterflies are fairly inactive in temperatures below 70 degrees and predicts warmer temperatures this afternoon. Then there will be more activity among butterflies and visitors. With this light rain outside most visitors stay in their guest quarters. Later the butterflies will become more vigorous, but for now their wings slowly fan open and close as they gather on green stalks of plant life. Several drift across the heights seeking nectar from new flower. Doug points out clusters of golden monarchs on several branches near us. I inhale deeply and slowly the scent of flowers and fresh, wet plants. Watching the butterflies dance lightly from green to green gives me a sense of Doug’s dream. There is life here. Unlike the poor dried victims on my car grill, these bits of color are floating silently through the shades of green. I have seen these softly balanced wings portrayed on people’s garages, cut from wood, or molded from metals, pinned on people’s collars. I have also sat in the lush green of my own back yard as a child and watched a black etched, autumn-orange Monarch balancing quietly on a milkweed pod. But I had never experienced a colony such as this one, a colony flitting from leaf to flower to leaf. In this enclosure, Doug is breeding two hundred butterflies from eighteen species. With the moths the butterfly species number 100,000, one of the largest of the insect family. Most butterflies lay eggs individually, spreading them among the stalks. Here in the Butterfly House Doug has developed five egg-laying stations. Each station is simply a grouping of plants, which attract certain species. Wildlime plant attracts the giant Swallowtail, Fennel the Eastern Black Swallowtail, and Passion Vine the Zebra Longwing and Julia. There is also Milkweed for the Queens and Monarchs. Unlike most other butterflies, which scatter their eggs individually, the Pipevine Swallowtail clusters its eggs on the stems of the Sristolochia plant. From there come the larva, and then the spinning of silk, the hardening of the chrysalis or pupa, and then rebirth. After that the cycle begins again. 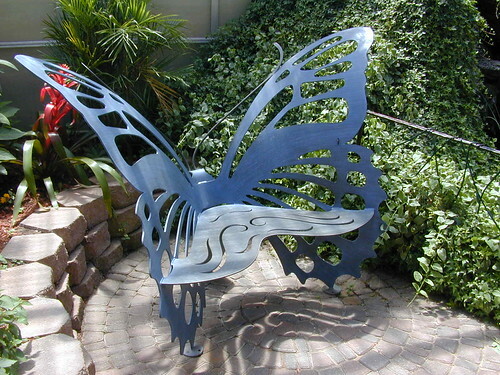 A poster placed near a bench informs visitors that the mating process of the butterflies is called the “dance” attributed to the mating dance, as they communicate their sexual desire vying for each other’s attention. The dance continues time after time, as the bits of golds and yellows flutter through the greens and reds of Doug’s environmental design. Cycle after cycle through the mating dances, each species reproduces, the next generation, which will dance again and again, over and over. Some butterflies, such as the Pipevine, are a dying species. I am implored by another of Doug’s posters, a handwritten white poster board with pictures of the butterfly and the plants, to cultivate Pipevine or Dutchman’s Pipe plants in my own yard to attract this endangered species. He advises me that this might reverse the extinction of this species. I know little of butterflies, but Doug is stirring me to preserve this bit of beauty I see before me. Some preserve the species by pinning the dried bodies to pieces of felt, enshrining them beneath clear sheets of glass, labels announcing their names, their prize carefully dried and then mounted in its place of honor. Children rush through fields of daisies swinging white gauzy nets, capturing one, then another, and another. For Bill and Doug, “two men in their forties still playing with butterflies,” the game has now become a bit more refined, but their spirit is the same as that of children chasing butterflies. Doug does not search the spring fields for his prizes. He only has to look in his own back yard. 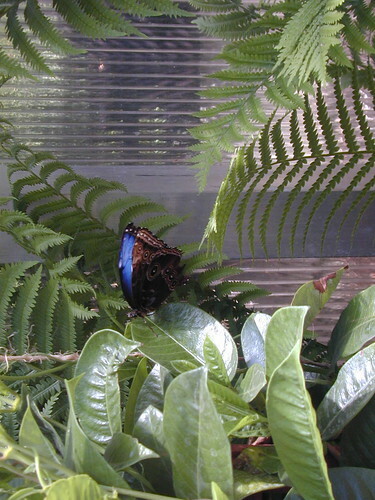 Within the security of the Butterfly House he can breed new species and enjoy the full life cycle of his treasures. Despite his high volume, competition with other greenhouses on the island and limited market began driving his business into debt. He still sells potting plants to island residents but, despite his efforts to make it work, the greenhouse idea was failing. That’s when the butterfly dream was born. The city council didn’t want to allow him to continue his new business in the residential area. Doug had served as a city councilman on Mackinaw Island for nine years, three three-year terms. Since his business was creating a conflict with his work as councilman, Doug resigned and continued his crusade to keep his zoning. Eventually the council agreed to let him give it a shot. Doug had convinced them of the similarities of the two businesses. 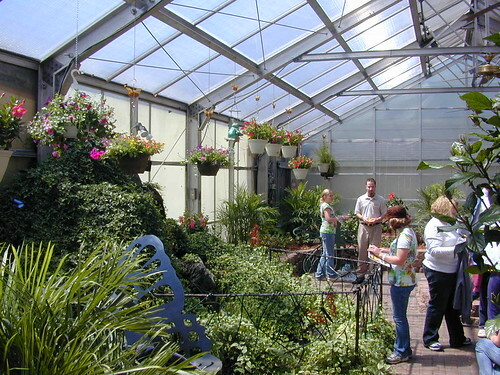 One was a commercial greenhouse and the other was a greenhouse for tourists. This allowed him to continue at this location under the grandfather clause. But they did find one issue. “They made me add more bicycle racks,” he said. “Since there are no cars on the Island, the only way to get around other than walking is by horse or bicycle. We don’t have a parking lot, just bicycle racks.” Once the council saw that Doug’s business was more than an idealistic dream, they began giving him more support. He has been included in island advertising and is even leasing a full-sized billboard on highway 27 coming up from southern Michigan. He is anxious to see his business drawing visitors from all parts of the United States and the world. There is a sense of immediacy about the life of a butterfly. Once they have found flight, freedom from the pupa, they feed from the golds, pinks, and reds of the flowers Doug provides. Their eggs are spread choicely among the breeze swayed plants, hatching in anywhere from a few days to months. The larva or caterpillar lives two weeks or more before it transforms into the pupa stage. Some larva spin a silk cocoon around themselves. Others split their exoskeleton and form the chrysalis. This metamorphosis can continue from a few days to more than a year. Many spend the winter in the pupa stage and emerge in the spring. It is during this pupa stage that Doug closes the house for the winter, due to the cold climate, and sells many of the eggs and pupa to other organizations. When the permanent glass structure has replaced the mesh tent, Doug will be able to control the climate and leave the butterflies there for the winter. In the spring the butterflies once again begin the mating dance. Last spring Doug and Bill placed nearly 600 plants inside the Butterfly House, setting the banquet table, which I now see before me. “Nectaring plants,” plants for food — include Lantana, Pentas, Porter Weed, Corepsis, and Budlea, the Butterfly Bush. There is also a dessert of annuals such as Alyssum, Ageatum, Marigolds, Snap Dragons, and Dianthus. Everywhere I look in the Butterfly House swatches of color gently fan their wings, their proboscis (straw-like tongue), seeking the sweetness of the nectar. Their feast, however, is not tasted through their proboscis. Butterflies taste through their back feet where taste sensors are located. Not many insects are pleasing to the eye of man. Some crawl quickly in clusters through garbage heaps. Others squat in menacing stances waiting for their prey. But butterflies, the Lepidoptera of Doug’s house, dance colorfully from limb to limb and quietly feed on the fruit of Doug’s plants. Each one sports six legs, three body parts, a head, a thorax, and an abdomen. Its four wings are covered with scales. The desire to cradle a butterfly in one’s hand is strong. The desire to touch its wings and its apparent softness has caused the early demise of numerous butterflies. Just slight pressure on the overlapping scales on thin wings causes them to flake off like a colored powder. Once these scales are damaged the butterflies lose the ability to regulate their body temperature. Doug conscientiously pulls a small branch forward for my picture, cautiously avoiding any contact, revealing a mature Monarch. And then I see another, and then another. I see the emergence of new butterflies before me. Everywhere I look the cycle continues. Doug tells me that most of these butterflies will only live for a short time. Once the butterfly emerges from its shell it lives an average of two weeks. Some, such as the monarchs, may live up to eighteen months and migrate up to two thousand miles. Few survive to make the complete migration. Usually the females lay eggs on the way home. The new generation returns to the original migration point where they carry on the dance. The beauty of survival is evident in these delicate creatures just as it is in Doug’s determination to protect the species. The beauty that surrounds Doug’s dream has been touched by his own fragility. He is 39 years old and is still going strong with plans for expansion. But when he was 22 and again at age 26, he was treated for Hodgkin’s disease, which had claimed the life of his younger brother. Although the disease is in remission he was recently placed back in the hospital. “At first they suspected it was Hodgkin’s. It took them three and one-half weeks to figure out what was wrong. It wasn’t Hodgkin’s; it was a bacterial infection of my heart.” He had also suffered from a bleeding ulcer and blood clots, possibly as a result of the medications for the infection. After eight weeks he was discharged from the hospital and returned to the dream of building his butterfly house. As I wander through the Butterfly House I am drawn by the sound of flowing water. Jutting out from one side stands a small fountain and a waterfall. Ferns veil chunks of white limestone rocks and wood bark. Butterflies linger among the ferns. A half-dozen goldfish are swirling in a shallow pool at the foot of the mini-falls. An intermittent clicking of a camera interrupts the sound of trickling water. Other visitors have just strolled in, silently, speaking in whispers, pointing and smiling. Like an excited child, Doug shows them the colorful clusters of eggs. He enthusiastically directs them toward the gatherings of fluttering wings and lush feeding plants. Like a child during show-and-tell, I watch him lead the other wide-eyed observers through the reality of his dream. After they leave I once again say goodbye to Doug, telling him I hope to visit again next year. He leads me through the courtyard toward the front of the building. He continues to point out old geranium pots, walls he intends to paint, and new entryways he intends to add. He flits from one subject to another, from goal to goal, from dream to dream. In a dance of effervescence he shows me his plans for his continuing cycle of metamorphosis. Despite the struggles, Doug’s survival is colored with vitality. I finally tell him I must leave. As I take one final look around, a cool breeze reminds me of the lateness of the season. Autumn is slowly enveloping the Island. Outside the Butterfly House I can hear the dried green leaves rattling in the wind, mingled with the smells of Lake Huron. In a few months the Island will grow cold, blanketed with a bed of snow and ice. The Straits will become a frozen highway for snowmobilers. The Island visitors, like myself, will have taken the last boats back to the mainland of Michigan until spring. But Doug and Theresa will nuzzle into their home and enjoy their son Woody and daughter Bliss. Snowmobiling, walks, and good books will fill their days and nights as Doug dreams of next spring, when the Butterfly House once again will emerge as a place of the dance.